i’m a curry chicken salad convert. like some of you- i used to have a mayo aversion. but then i realized- it is really just egg and oil- what could be so wrong with that? and it makes things taste good. but mayo-averse- keep reading. this chick salad is made mostly with greek yogurt. i think the one tablespoon of mayo helps round this dressing- and relieving it of the tart flavor of the greek yogurt. As for what’s in your curry chick salad – go wild. some like raisin, some like grapes- some like nuts. I aimed for a crunchy, colorful mix. 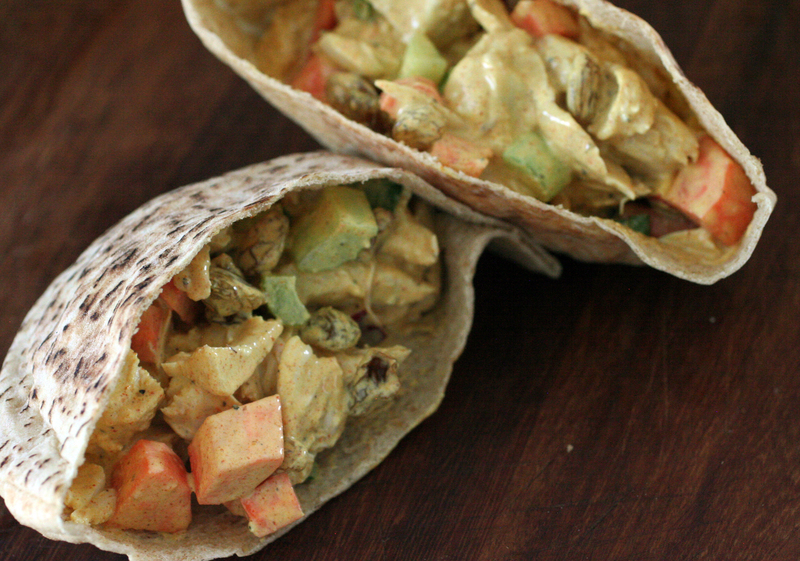 Curry Chicken Salad- the dressing part of this recipe is adapted from a Martha Stewart recipe. This is where you should feel free to improv. Add things you like- omit those you don’t. Add more or less carrot/celery- etc. as you like. preheat oven 350. wash chicken breasts. Pat dry. Coat with olive oil, salt & pepper. Cook 35 mins or until juices run clear. in a bowl stir yogurt, mayo, 2 tsp lemon juice (i used more to taste), curry powder. Season w. salt & pepper. Once cool, pull of skin and pull chicken off the bone. Cut into pieces. Put chicken in a bowl. Added the veg, scallions, raisins etc. Add dressing- a bit at a time. Until it looks like enough. No rule says you have to use it all (tho i did).